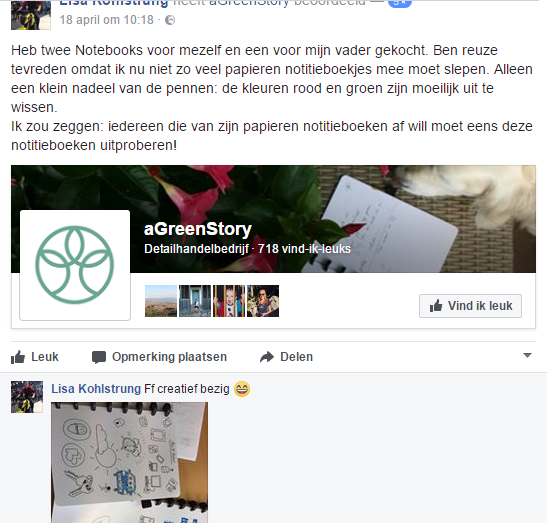 This is an exciting month since the aGreenStory team is preparing for the launch of the brand new website as well as a crowdfunding campaign for the improved customisable whiteboard notebook. This report shows how we aim to support both events on social media. 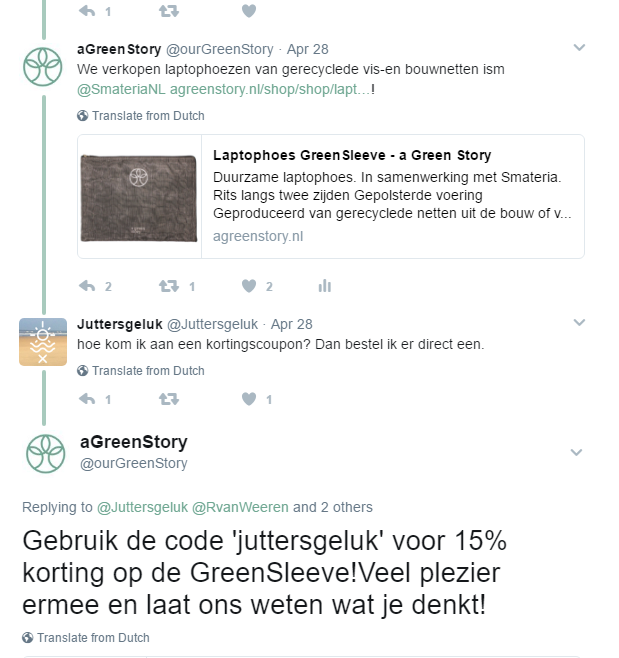 In this case, interaction about GreenSleeve resulted in a lead with high potential of a sale. With the crowdfuncing campaign coming up, it is crucial to interact with influencers, for example by higlighting them on our social media to draw attention. We're integrating links to Pinterest into our social media channels. This month we've been sending out lots more content, both new and recycled, resulting in an increased reach. Even though impressions are not among our KPI's, it is important that the social media platforms are alive in order to fulfill our aims of lead generation and customer service. 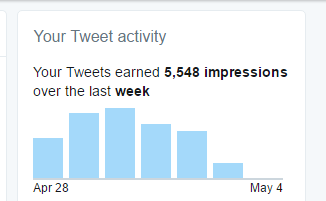 After starting with Buffer, the weekly impressions on Twitter have risen extensively. Although this isn't one of the KPI's, an up to date timeline is valuable because the Twitter account is to become more of a customer service platform. 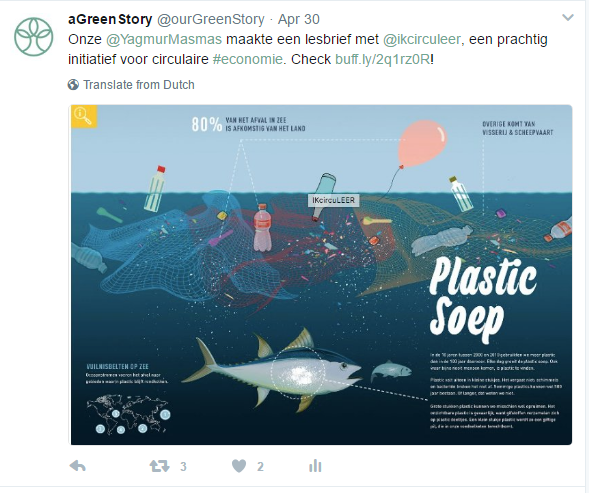 Because aGreenStory profiles itself as green company, there are interesting opportunities for tagging other brands with a similar mission in order to increase reach. The Pinterest Tweets have been doing well. Because our boards are about more than just our products, we're able to extend the reach with more general hashtags which may be of interest to our target audience. 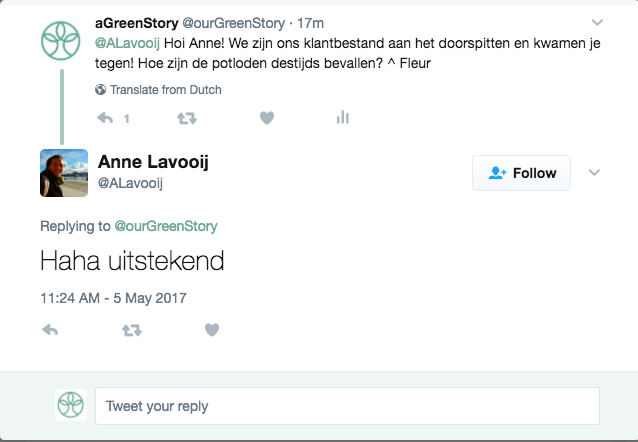 One of the themes that has been doing well on our Twitter is zero waste. 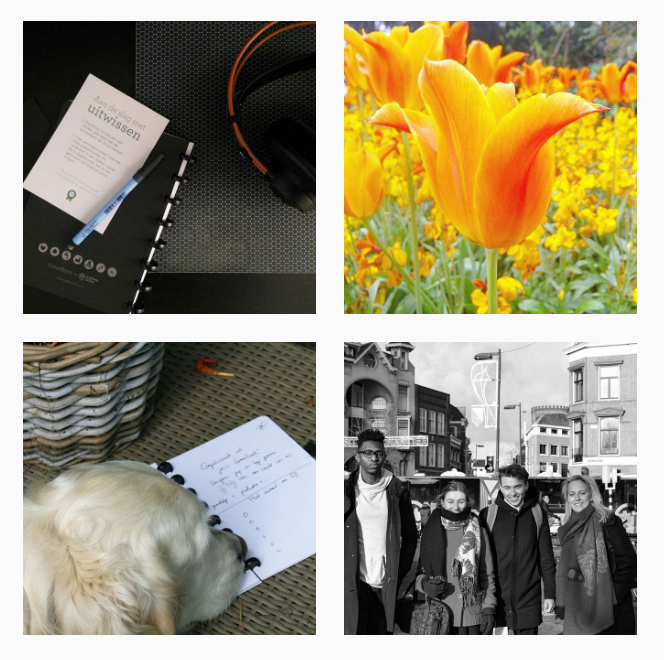 We will be creating and sharing more content relating the brand aGreenStory to this way of life. 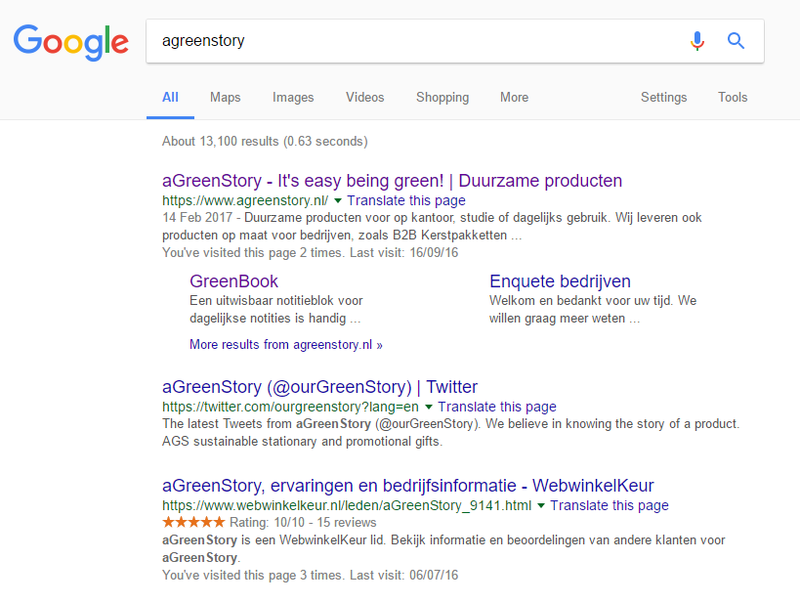 When googling the company name, the first three links are to our website, our Twitter account and the independent organisation where customers can rate our webshop. Regarding google rankings, we are on the first page for the search term "whiteboard papier". 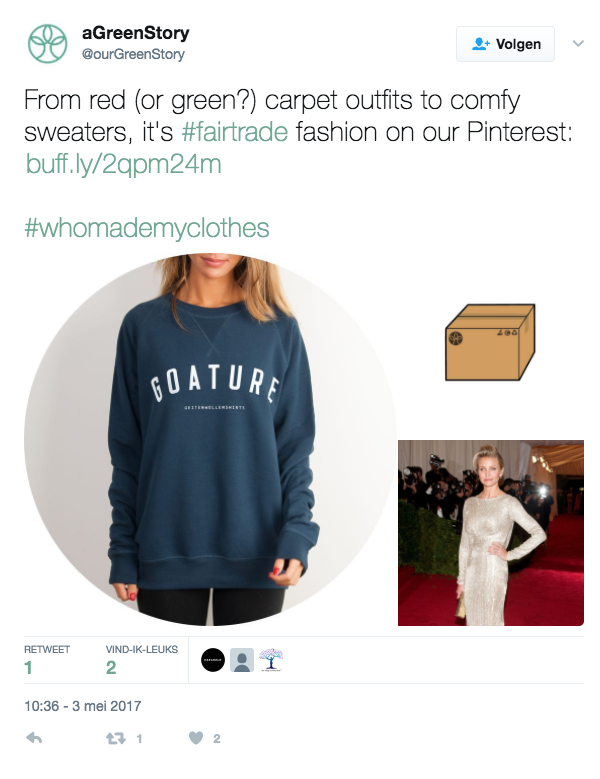 Since Pinterest is increasingly being used as a search engine, 13 boards were created with themes of green and fair trade inspiration such as fashion, lifestyle and design. 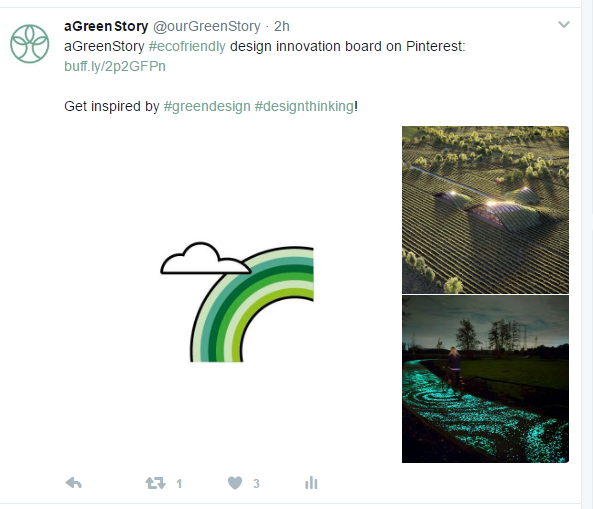 aGreenStory's products are also mentioned in several boards and illustrations in our brand colors are included in every single board. 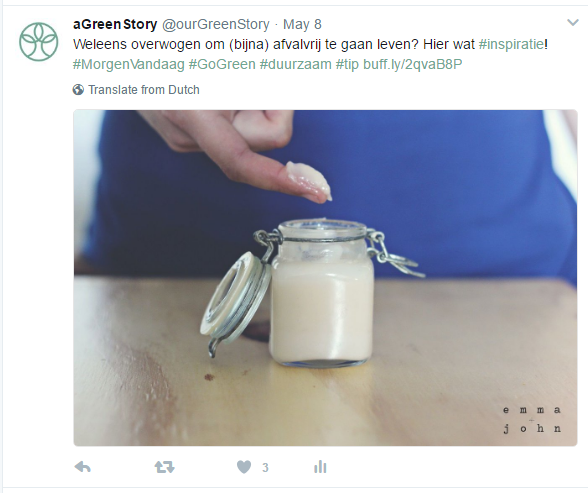 To us, influencers are not only bloggers and famous people but also companies and social entrepreneurs with a relevant green or fair trade mission. 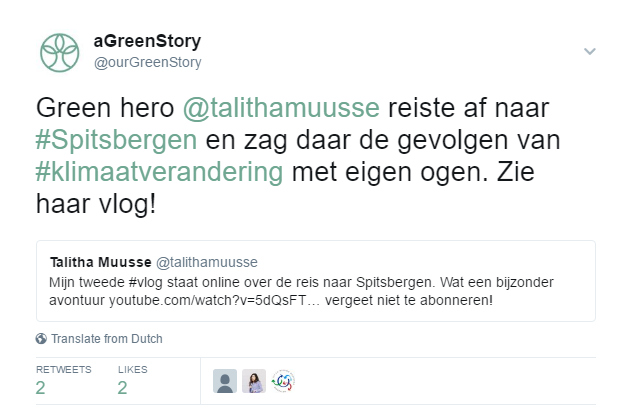 Influencer Talitha Muusse retweeted our Tweet about her. At the moment, Instagram is not a high priority because it's not very helpful for our main KPI's which are lead generation and customer service. It has been interesting to get in touch with influencers, therefore a basic presence is required. 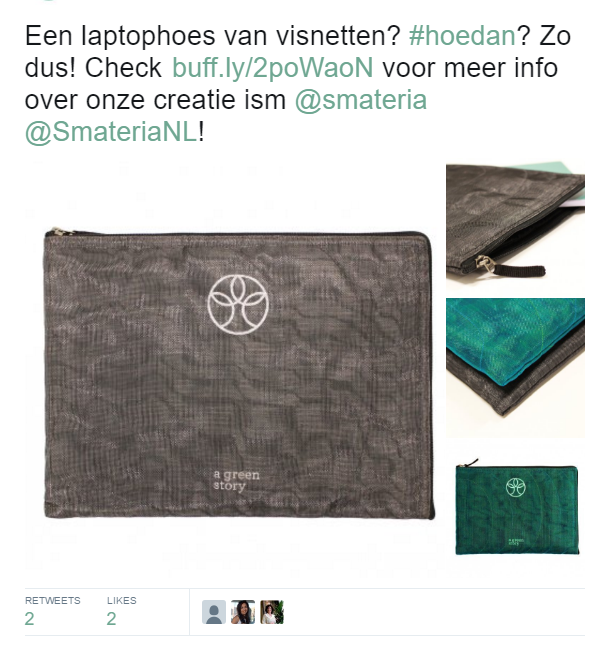 A general product Tweet was retweeted by relevant influencers thanks to tagging our collaborator organisation Smateria, which produces the laptop sleeves in Cambodia. We are currently approaching customers - no matter from how long ago - to see how they liked our products and re-establish contact with them. Again, we are reaching out to customers. 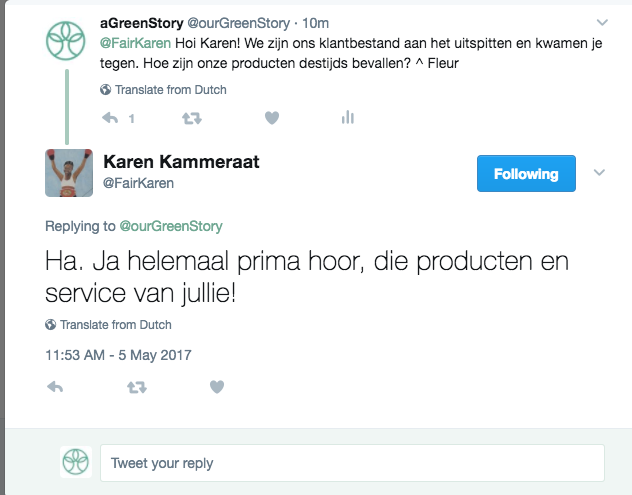 Some of them, like this lady, have their own business related to sustainability, and we would like to involve them in the launch of our new website. We love receiving customer reviews! Especially when they include a creative picture of the customer's user process with our products. We make sure to take the time for replying to every message. 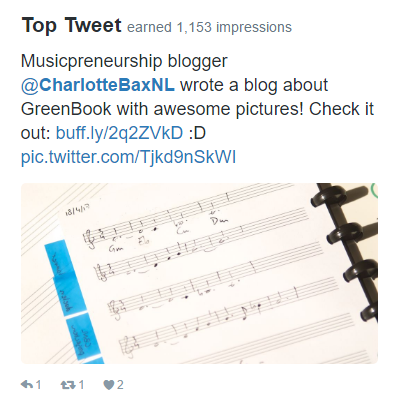 Charlotte wrote a blog about GreenBooks music pages. Perfect content for social media and more elaborate than a review. 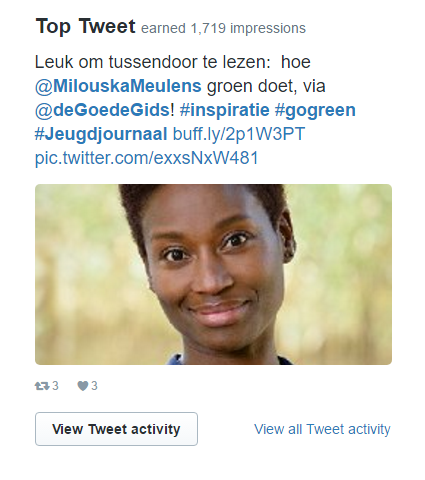 Overall, it has been a good start for aGreenStory social media. This month, the main priority was sharing content consistently in order to establish a presence. 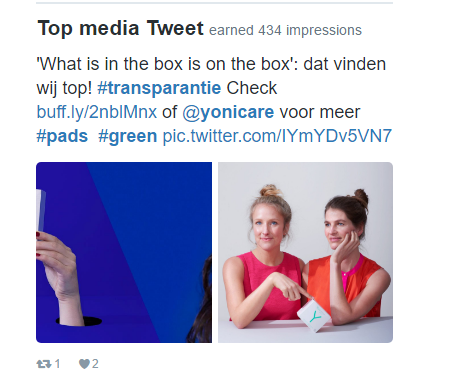 Moreover, the team has been trying out different hashtags to see which ones resonate with our target audience. In the next few months, the focus will shift to lead generation, customer feedback and aiming to get new reviews. This report was loving created by aGreenStory.